Is Hyundai having a concept car in store for the upcoming 2009 New York Auto Show? 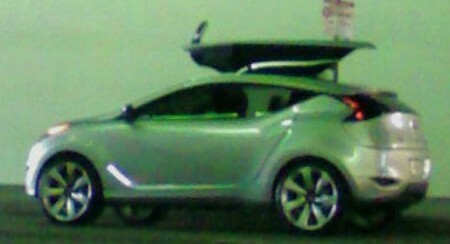 Folks at Autoblog have posted some interesting (spy) shots today. One of their readers has caught an unknown vehicle -possibly a concept car, while parked on the street. The unknown concept could be yet another Hyundai concept car. If that turns out to be true, then we will likely see it officially unveiled during the forthcoming New York International Auto Show that kicks off in the second week of April. Although the pics are not of the highest quality, you can see the concept features a very attractive crossover-like exterior design and a pair of huge gullwing doors. It is coated in the silver color and equipped with a set of huge tires and 7-spoke alloy wheels. At its rear-end, you will notice very small rear.window and a pair of bumper integrated chrome tail-pipes. Now, the main reason why we think this is a concept car from Hyundai Motor Company lies in its design DNA, which resembles that of the ix-onic crossover concept revealed in Geneva earlier this year. Another fact speaking for its self is that over the last few years, Hyundai has used the “Big Apple” auto show events to preview some of its most important production-ready models and concept cars.